The Pyrenees of Huesca wake up with Spring and the valleys are filled with rivers. 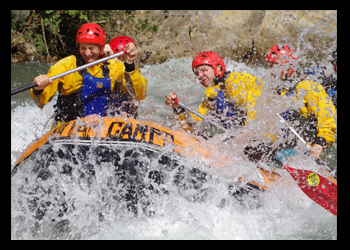 What better way to enjoy the good weather in Huesca and descend rafting whitewater, enjoying spectacular scenery? The characteristic Pyrenean rivers guarantee us a summer of excitement, and for us the Aragonese Pyrenees is one of the few places where you can go rafting in Huesca throughout the season. 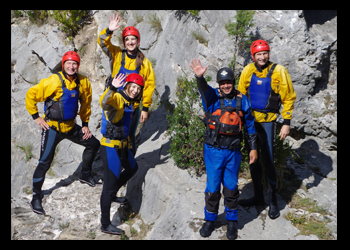 For lovers of rafting, Huesca is an ideal destination for beginners looking for a safe place for your first contact as to the most advanced looking for a challenge full of adrenaline. The trips in rafting in Huesca are prepared for all kinds of visitors. Where go rafting in Huesca? 70km navigable without dam, the Ara River is the River to Pyrenees most visited by lovers of rafting in Europe. Besides the quality of its white water, the natural environment where you will find the Ordesa National Park and Monte Perdido, is the most attractive in the region. Por other hand, both for lovers of rafting, kayaking or hydrospeed, the Rio Esera River is the second most valued and favorite to people of Aragon. Located in the Valley of Benasque born in Maladeta massif, this destination has more than 6 navigable sections for all levels. Moreover, it is one of the best places to learn Kayak in Huesca. The Cinca River is a neighbor of La Ribagorza, ideal to unwind thanks to its special tranquility that allows sightings of birds and the special landscape of the Peña Montañesa. Gallego River, located in the pre-Pyrenees of Huesca. Thanks to its geographical location allows us to enjoy the view of the Mallos in Riglos background. Enjoy Rafting in Huesca with us, contact and book with us!